Investigators have identified the causes of consecutive launch mishaps with the Proton and Soyuz rockets, clearing a major hurdle in preparing to return the workhorse launch vehicles to flight. In an announcement Monday, the Russian space agency said the investigation into the Soyuz launch failure Aug. 24 was focusing on a malfunction in the rocket's third stage gas generator. 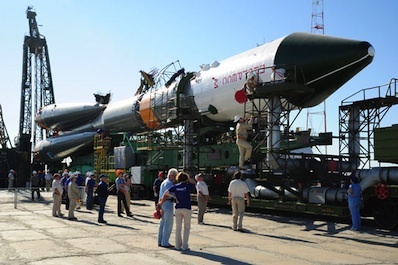 The launch was carrying an automated Progress cargo ship to the International Space Station, and debris from the mission crashed in the Altai region of southern Russia. "Off-nominal performance of [Soyuz third stage] propulsion system was found by the board to be due to the gas generator whose operating conditions were disrupted," the Russian announcement said. The Soyuz investigation has not formally issued its findings or recommended corrective actions. A launch schedule for the next manned flight to the International Space Station will not be decided until the commission completes its work. The inquiry into the Aug. 17 launch mishap of a Proton rocket and Breeze M upper stage has concluded a programming error doomed that flight, the space agency said in a separate statement released Tuesday. The launch failures left Russia's two largest rockets grounded, but the Russian space agency -- also known as Roscosmos -- said Tuesday it was lifting the suspension on processing for upcoming Proton and Breeze M flights. The commission established to look into the Proton mishap said that during programming of the Breeze M upper stage's guidance system, the "time interval to manipulate the gyro platform into position was made unduly short," according to Roscosmos. "This resulted in an off-nominal orientation of the Breeze M and, as the consequence, in injecting the [spacecraft] into an off-design orbit," Roscosmos said, noting all other Breeze M upper stage systems worked normally. 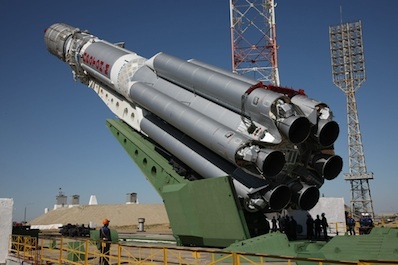 The Proton/Breeze M was launching the Express AM4 communications satellite for the Russian Satellite Communications Co., a state-owned spacecraft operator that serves Russia and neighboring countries. The satellite was deployed in a lower-than-planned orbit and ground controllers have been unable to contact it. "The ban on Proton/Breeze M ground processing has been lifted, and appropriate recommendations have been prepared, to be implemented prior to the upcoming launches," Roscosmos said. Roscosmos and Khrunichev, the prime contractor for the Proton and Breeze M vehicles, will soon set the Proton launch schedule for the rest of the year, the statement said. A Russian military communications satellite, the ViaSat 1 and QuetzSat 1 telecommunications spacecraft, and a trio of Glonass navigation satellites were next on the Proton rocket's launch manifest before tha Aug. 17 anomaly. International Launch Services, a U.S.-based, Russian-owned marketing and sales firm, arranges commercial Proton flights for satellite operators around the world. The ViaSat 1 and QuetzSat 1 missions are managed by International Launch Services.